When I began reading Dave’s post yesterday, I smiled and nodded. I’m up to my eyeballs in the final edits for Nocturnal Revelations. My brain is focused on not only the edits but what needs to be done to promote the book between now and release date. So figuring out what to write for MGC is, well, challenging. Because of that, I did what I often do when I’m having a hard time coming up with a topic: I wandered over to The Passive Voice. BTW, if you aren’t following TPV, you should, especially if you are a writer. Anyway. . . .
A couple of posts caught my eye. The first mainly because I’ve been going through the rounds of getting a cover done for Revelations. This is the first time in, well, just about forever I won’t be releasing a book with a cover that Sarah’s done for me (and, before anyone jumps to any conclusions, it’s because she’s been sick and so has her computer. Besides, when I rebrand the series, she will be doing the covers. I didn’t want to bring this book out with the “new” brand covers and the others not match.) What that meant was finding someone to do the cover for dirt cheap. I also used it as an experiment because I’ve had folks ask me about sites like Fiverr and I couldn’t answer because I had no experience with them. I approached the Fiverr experiment in two ways. The first was to set a budget for the full rebranding, along with a timeframe, and ask for bids. The interface is very simple to use. I listed the number of covers involved, that they would include not only e-book cove but cover flats for print, genre, and covers I liked the “feel” of. Within a couple of hours, I had more than a dozen responses. Some I could toss out right away because they were offering to write or edit the books for me. Others I tossed out because the responses were so poorly composed. Yes, I know, I shouldn’t judge by I can’t help it. This is my business and I expect a certain level of professionalism. When I got it narrowed down to a manageable number of possibles, I started checking out the artist sites. It was amazing the number who said they would do the project at the maximum amount of my bid and who obviously didn’t think I would check their sites to see how much they normally charged. Almost all of those who wanted my full budget would do the covers for less, often a great deal less, if I simply went to their page and contracted by individual cover. So, again, they got booted from consideration. I’ve made note of those artists for future use if I need them and to recommend to others. But that still left me needing a cover for Revelations. So I went strolling back through the bids as well as other artists on the platform. I finally found one who could do the job in a couple of days and who was, admittedly, dirt cheap. After all, I’m going to rebrand the series and didn’t want to spend hundreds of dollars for a cover that would soon be replaced. Communication back and forth was quick. He asked specifics about the book and had two different mockups to me within 24 hours. And that was where I came up against the problem of the difference between covers in the US vs other parts of the world (for an example of this, see this post over at TPV). The mock-ups he sent screamed “indie” and did not have the “feel” I wanted. One even used an image that anyone who has ever played video games before would recognize as Lara Croft. Nope, nope, nope. I explained my concerns to him and wound up sending him several images I already owned rights to and that would fit with the current “brand” for the series. He asked a few more questions and he obviously checked my Amazon listings because the mock-up he sent the next day fits pretty damned well with my previous covers. The lettering isn’t quite what I’d like but he’d done more work tweaking–hell, redoing–the cover than I’d contracted for, so I wasn’t going to get that picky with him. Now, is this an all-out recommendation? No, Fiverr and sites like it serve a purpose. You can find artists, many of them excellent and very expensive and others just starting out and hungry. But like with anything, you need to do your homework. You also need to know you are rolling the dice and you might not get an image you can use (always be sure to see how many revisions you are contracting for. It may be one or two, up to five or unlimited.) You need to make sure you understand what the completion date will be. If you write genre fiction, you need to understand that the artist might not be familiar with your genre and how to cue it in a cover. There are a lot of factors you have to keep in mind. Most of all, you have to ask yourself if paying for a “pro” level or even level 3 artist (which can run into the hundreds or thousands) for a cover is something you can justify. And, honestly, the only reason I went this route was I was going cheap since I knew I’d be doing a rebrand of the series in the next few months, and because I wanted to see how the site worked. It was a positive experience for me, but that doesn’t mean it will be for everyone. One more thing before I head back to the editing grindstone. If you use Patreon or are considering it, check out this post by The Passive Guy. It is concerning enough that they may be raising their fees again. What is more concerning is the possible rights grab you agree to when you agree to their Terms of Service. This is something we all need to be aware of. And this is why I’d never seriously try to become a cover artist full time. Because I simply will not compete with sites like Fiverr, and most authors have no idea, and don’t care, as long as it’s cheap. Cedar, I totally agree. If I wasn’t going to rebrand the series, I never would have gone there. I would have contacted you or other artists I know. But I knew the rebrand was coming and I was operating on a very short timeframe. Also, as I said, I wanted to see what the experience was like since folks do ask. Now I know and can give an informed opinion–which will be basically that same as it had been before. If you know an artist who will trade services with you or if you know you will get a good ROI, then go with the artist. Otherwise, you have to look at what you are paying out vs. what you can reasonably look at getting back in royalties. Unfortunately, not everyone can afford an artist or they want you to do a unique cover at pre-made cover prices. As a research project this was very effective – and it’s a good thing you were able to find someone you could work with. LOL. I like the image. The text needs work. That was my thought. Nice visuals, mismatched text. But I’m impressed by the positive effort the artist put forth, and he’d certainly go on my Good List for future work. Reziac, I felt the same way. That’s why he is on my “contact if in a bind for a cover quickly” list. Phantom takes a run at “Art Director” job. “The text needs work” was the first thing I thought of after I finished ogling the nice female character. The figure looks a lot better than the usual stuff from Daz, the artist got the depth and the lighting right. It doesn’t look like a video game character, it looks like a proper painting. The female figure looks great. The tiger head should have its eyes even with the figure. The female figure is positioned too high, she’s encroaching on the space that the text should be in. My solution would be to make all the text white (or light, anyway), all the same type face as the author name, move the figure down and a little more center, remove the tiger head, and add a “this is the best book evar!” quote text block about where the figure’s hands are. Phantom, you hit pretty much my concerns with it. You’ll note the updated version addressed some of them. It is much better with the tweaks. That’s a better setup. Title text is still too small, it is out of proportion. Maybe try two lines for the title, larger sized letters, same font. First line justified left, second justified right. Bigger tiger head works. Might consider using it as background? On further consideration, I don’t know if I’m in love with the angled stripe of text. It does get you more room, but it looks like a sticker got slapped on crooked. 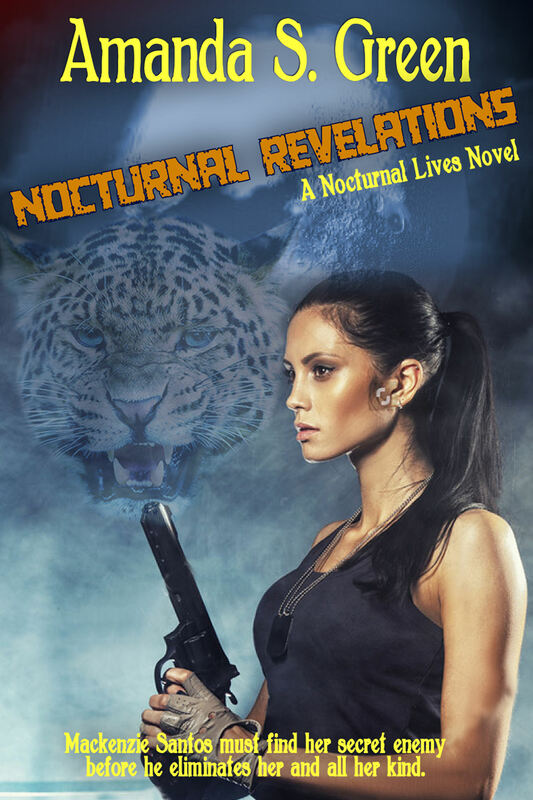 Angle of smaller text “A Nocturnal Lives Novel” is not the same as title, its a wee bit crooked. So easy to get suuuuper picky, eh? ~:D Especially when somebody else is doing the work. Seriously, while I appreciate everyone giving input, you have to remember that there is little reason to spend a lot of time redoing and futzing with it since it is a placeholder until the rebranding can take place. I’m being bad on purpose now. In truth I’m grateful for the opportunity to trouble-shoot a work-in-progress, because I have to do exactly the same thing pretty much right now. Since my characters are all screwing around in party mode, I can’t finish the book, so I need to FINALLY get some art done. Meaning I have to sit down with Rhino and Daz and apply my creaky old self to that steep, steep learning curve. I can practically feel the crust flaking off my ancient brain. Like Godzilla standing up in the desert looking around and saying “Raaarw!” And then shooting atomic breath at something just because. That’s right, learning curve. The Ancient Atomic Brain is coming for you. When choosing a cover, choose colors that will let a title pop out against it! I remember times when neither black nor white really stood out. Which is why I said the text needed work. But you also have to remember that you are looking at what is little more than a thumbnail, so not all text will be legible, no matter what color, font, etc., you use. However, the updated image is better than the original. 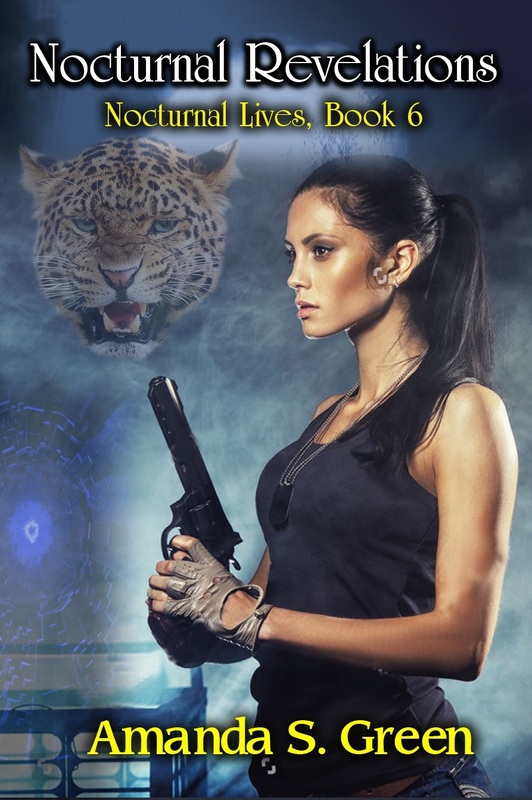 Something on the cover jumped out at me – both fingers in the trigger guard? Your character knows better. The model has likely never fired a weapon. I know, I know… I still look forward to reading it! LOL. I know. I thought the same thing. Unfortunately, that is a problem when you are dealing with photos someone else took. One of the things I like is how this site also discusses covers. Packaging your story in a suitable wrapping. We try to deal with everything Indies need to consider. That’s why we ask from time to time for ideas for future posts. I know and it’s been very helpful. Diving through the archives is handy. You can also look at the covers on other indie writers and see who they used and go check out their portfolio as well. Yep. Unfortunately, a lot of authors, Indies and trad alike, don’t like their cover artists or cover designers. In fact, I’m seeing more and more dropping mention of their cover designers. I totally agree. Even though, I’m afraid most authors would ignore it. If they won’t put the artist/cover designer on the “legal page”, why expect them to list them on the product page? Shrug. I’m curious as to how much this cost, but understand why you didn’t go into details. If you feel so inclined, please drop me a line. Cover costs are a thing. PS: I credit the cover artist of my first three novels in the copyright page. I do credits for not only the cover artist or designer (depending on what they do but those who did the art elements when I have the information). If you want more information about the project, email me at amandagreen1957 at the google mailing place. Yes, I’m being obscure. I don’t need more junk mail than I already get. For what my opinion is worth, and I do claim a passing familiarity with your work, the cover “tastes” like one of yours. Hot, serious lady with a honking big gun just works for this particular series. Of course Phil already pointed out the gun bunny no-no, and I can see that the color and font of the text could be better, but still and all it works. Thanks, Uncle Lar. Check out the updated image at the bottom of the post. As for getting your hands on a copy, the first half is almost ready to be sent out to a few unfortunate–er, lucky–souls for a final look before publication. Updated image has been added to the OP. Patreon is going broke, having gotten Woke, hard. A lot of their biggest cash cows have quit the service, and they have a huge amount of debt, which explains the cash grab.